H&R street performance coilovers for your 2010+ Camaro V6 or V8 will make a huge improvement to the looks, handling and ride comfort of your car. Looking to enhance the looks of your 2010+ Camaro LS/LT/SS and how it handles? Upgrading your Camaro's suspension is a quick way to dramatically improve handling and cornering attitude. Engineered for street and occasional track use, H&R Coilovers feature a fully-threaded shock body (not an imitation sleeve-over) that allows you to easily adjust ride height and the way your Camaro sits to achieve optimum weight transfer, or simply get the aggressive look you've been looking for. Featuring H&R's exclusive dynamic damper technology, each shock is engineered to work in harmony with a progressive-rate spring, together creating a finely-tuned suspension system. 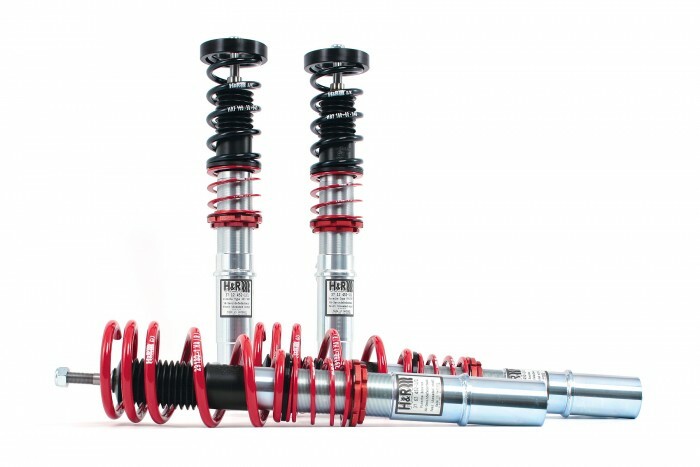 Coilover suspension provides a matched lowering spring and shock absorber combination with the added benefit of adjustable ride height and spring rates through a moveable spring perch. Coilovers give you an advantage by reducing unsprung mass, increasing suspension travel, and allowing the car to be corner balanced. In addition, coilovers offer a distinct advantage over lowering springs, since you can lower the car and still keep proper suspension travel-which will ultimately provide a better, more comfortable ride and increase the life of your coilover versus just using a lowering spring on your factory strut. Questions about the H&R Coilovers for the 2010+ Camaro? Our Modification Experts are standing by and available to help you, online or by calling 714-582-3330. ModBargains also offers expert installation and can install this upgrade for you. Call today!